Recently I found myself stuck in a rut when it came to my mid-week cardio routine. (On the weekends, hubby and I can tag team with kid-duty, but during the week I’m usually left to my own devices.) My available exercise window during the week is pretty darn small. The most efficient way to squeeze in some exercise is to hop on the elliptical…but that gets pretty old. 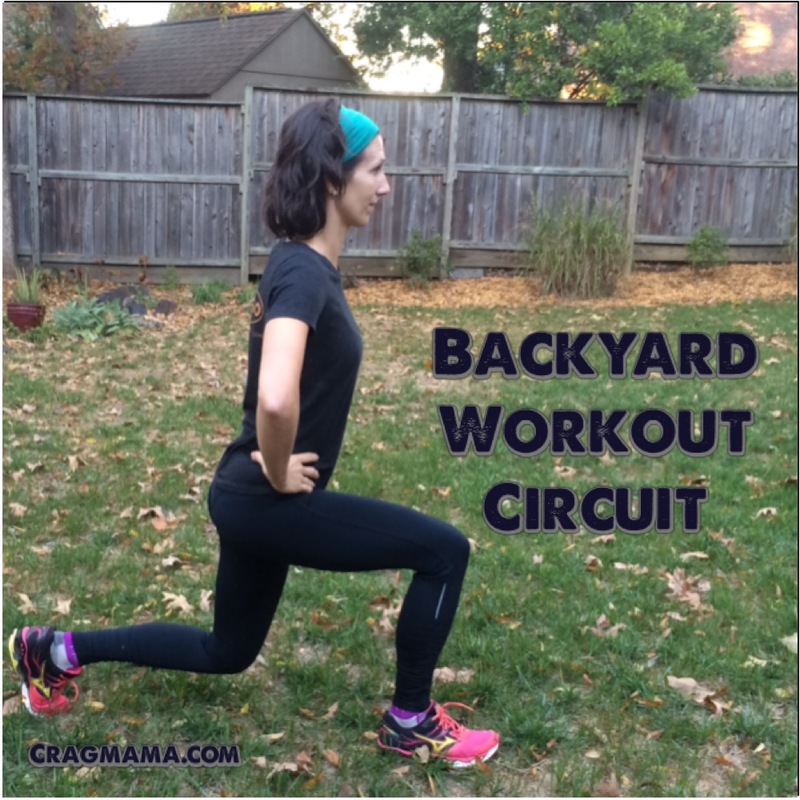 So lately I’ve been putting myself through my own cross-training “boot camp” type workout in the backyard. It’s a lot more fun than being cooped up inside, and it’s a great way to toss in some lower body exercises – something I don’t work very much in the climbing gym! My format is pretty simple – I choose 15 exercises and do each one for 1 minute. Then I repeat that circuit 2 additional times, giving me a total of 45 minutes workout time. Obviously you could choose more or less exercises, and repeat your circuit more or less times. Here’s a list of the exercises in my “arsenal.” Some of them are staples that I always do, and others are ones that I rotate through. I try to change it up a little bit every time so that I’m not always doing the same moves in the same order, but the gist is always the same. CRAB WALK, BEAR WALK, and any other silly things my 4 year old can come up with that gets the heart rate up. My favorite part about this concept is how family-friendly this workout is. I generally do it while Baby Z is sleeping, although I have done short (10-15 minute) circuits with her playing on the floor/ground near me. If she needs me I’m right there and it’s easy to just stop my watch timer and spend time with her for a few minutes before resuming. If Big C is around (ie, not at preschool), then I usually do it when he’s entertaining himself in the backyard. The cool part is that once he sees what I’m doing, he often joins me for a couple of minutes here and there (he is especially fond of skipping and jumping intervals!) I like that I’m able to not only model a healthy lifestyle for him, but also get him involved as well! Love it! I do this too – at the playground, in our yard, around the kitchen – and call ’em “On the Go” exercises. We have to squeeze ’em in where we can and it’s surprising at how effective a little amount of daily exercise can be!